Kontakt 5.3.1 is required to use the Kontakt 5 instrument patches in the KLI version of this product. This product does not work with the free Kontakt Player. 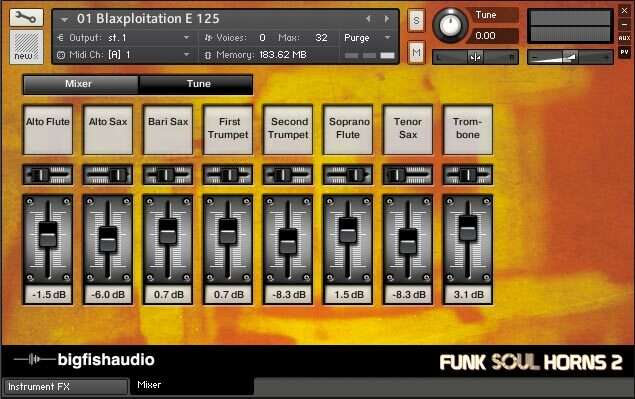 Following the success of the first Funk/Soul Horns sample library, Funk/Soul Productions brings you Funk/Soul Horns 2: a massive collection of over 2000 rock-solid horn section licks and over 950 solo-instrument licks created for use in all sorts of Funk, Soul, R&B, Hip Hop, and Pop productions. 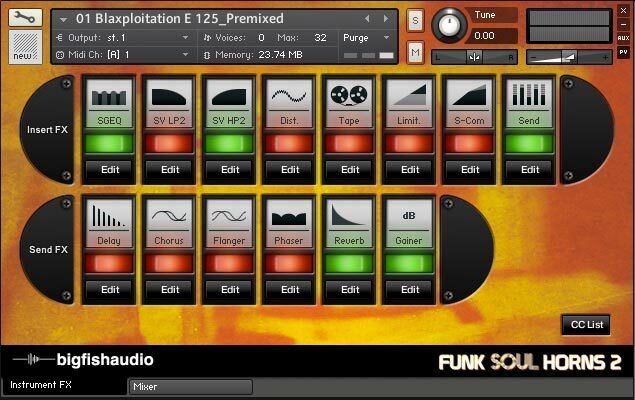 FSH2 takes over where FSH1 left off by adding more musical styles, including Philly Soul, Memphis Soul, Detroit Soul, and Soul Jazz, choosing the size and make-up of each section to match each style. We also added some new instruments to the sections, including soprano and alto flute and muted trumpet, and with Big Fish Audio's KLI format you can easily change the key and tempo of any horn section or solo lick to match the tempo and key of your song. 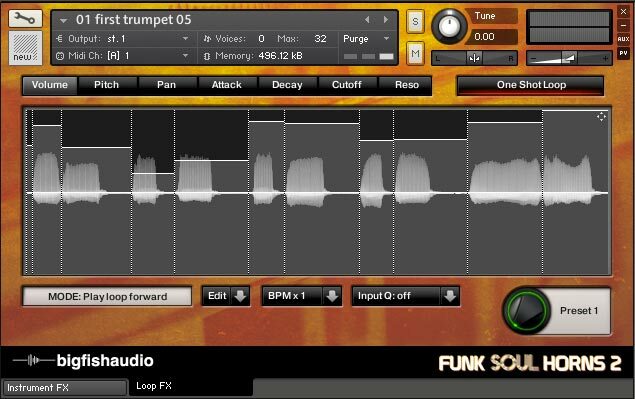 Like its predecessor, Funk/Soul Horns 2 presents each horn section lick as a pre-mixed full-section loop and with each individual instrument part broken out as a separate loop. 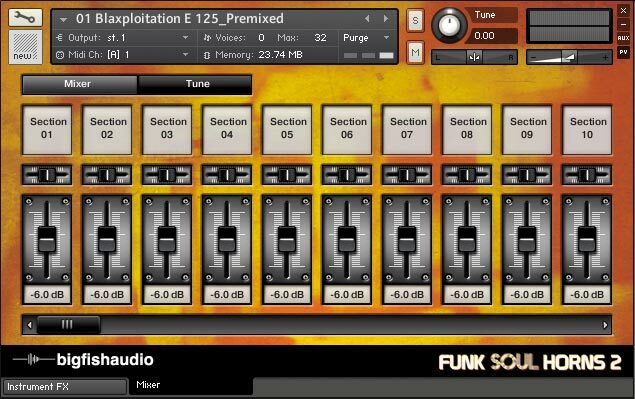 The pre-mixed section loops are fast and easy to use. Just add a little reverb to taste, and you're ready to go. For those who like to get into more detail, the individual instrument loops allow you to arrange and remix the instruments any way you like. You can choose which horns you want to use in a given section, allowing you to use the same lick multiple times in an arrangement, yet add musical variety by changing which horns play the lick in different sections of your song. 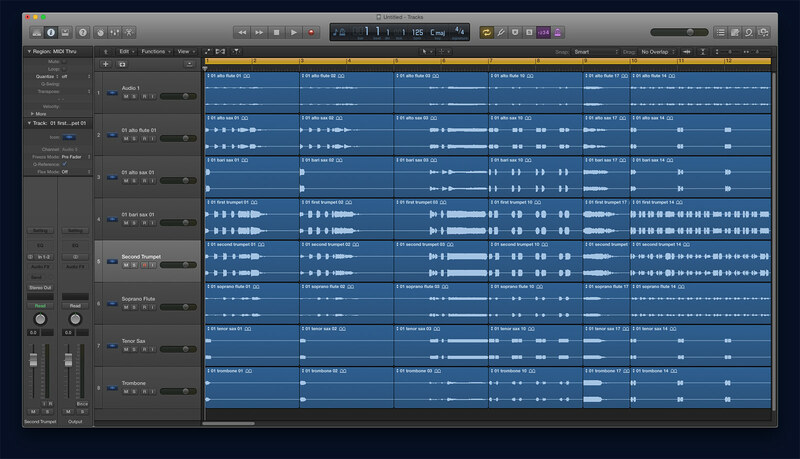 You can also control volume-level, EQ , panning, and additional processing for each individual instrument. Want to hear more trumpets, and maybe less bari? Want to pan the trumpet parts to one side and the flutes to another? It's easy to do in FSH2. And with Big Fish Audio's KLI format you can easily change the pitch of any note, allowing you to change horn section parts that are in major keys to minor keys, change section-voicings, and alter or add chord-tensions. Thanks to KLI's flexibility, you can create any number of different horn parts from the same horn section lick. 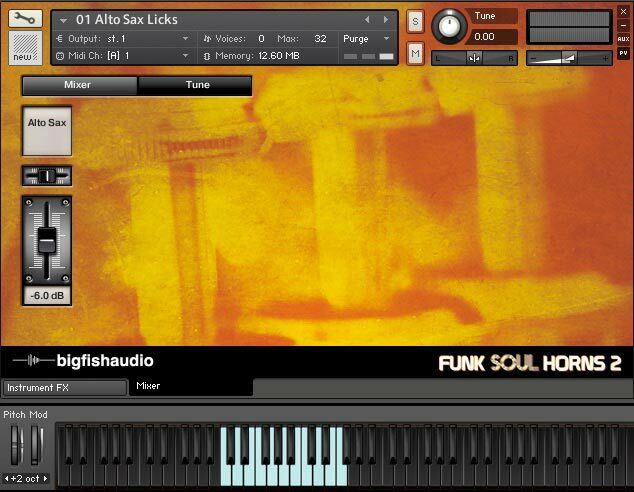 Funk Soul Horns 2 has been formatted in the most widely used formats on the market today: Apple Loops, Acidized WAV and REX files, making it usable in virtually every piece of software and hardware in use on the market today. 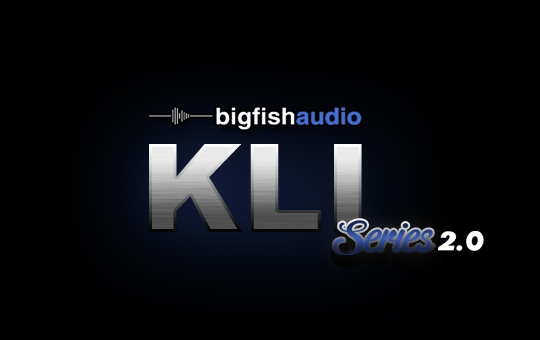 In addition, this library comes fully formatted for Kontakt as part of the Big Fish Audio KLI Series which transforms this loop library into a truly moldable and musical writing instrument. 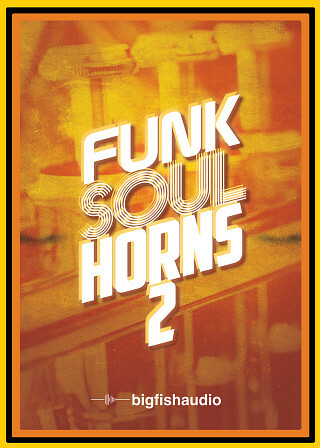 Funk Soul Horns 2 has been formatted in all the industry standard file types: Apple Loops, Acidized WAV and REX. Every piece of commonly used hardware and software will be compatible with at least one of these fully developed and usable formats. The KLI 2.0 Series allows you to quickly arrange and mix tracks in our Kit Combo Patches and make completely original drum tracks using our custom drum patches that include both multi-track drum loops and one-shot samples. Kit Combos - 83 patches are included in the “Kit Combos” section (59 of which are included in the Solos, licks & phrases patches). Each kit folder containts a “Premixed” patch, “Stem” patch and several single instrument patches for the solos, licks & phrases. “Premixed” patches contain the full mixes of all sections within each kit. “Stem” patches contain the seperate instruments, within their own group, and laid out on the keyboard from “Section 1” to “Section 18 (-23)” so that you can easily mix each individual instrument into your track. Modulation Keys are located in the C0-C1 octave range, loops start at C2 on the keyboard. Solos, Licks and Phrases - These patches are located inside the Kit Combo folders. All patches are organized by instrument. For example, all trumpet solos, licks and phrases for the first kit will be found in the patch titled “01 Trumpet Licks” within “01 Solo Licks & Phrases”. Sliced Loops - Each loop from the product has been given its own patch and can be edited extensively using the “loop fx” interface. The full loop can be triggered at C0. The loop can be played backward at D0. Individual slices start at C1 on the keyboard. The Following End User License Agreement is included with Funk Soul Horns 2. 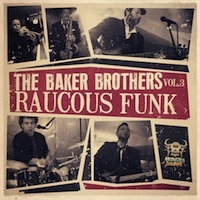 This License is only valid for the individual who has purchased an unopened, new and lawfully made copy of Funk Soul Horns 2 from a dealer or distributor authorized by Big Fish Audio. 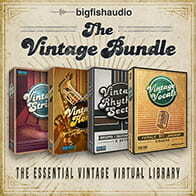 "The samples contained on our products are licensed, not sold to you, the individual end user, by Big Fish Audio. This non-exclusive, non-transferable license is granted only to the individual end user who has purchased an unopened, new and lawfully made copy of this product from a dealer or distributor authorized by Big Fish Audio. All samples remain the property of Big Fish Audio and are licensed only for use in the creation of a recorded or live performance that includes the licensed samples as part of a derivative musical work created by the licensed end user. This license expressly forbids resale, rental, loan, gift or transfer of these samples in any format or via any medium, except as part of a derivative musical work. This license does not allow you to include the samples, whether unmodified or as part of a derivative work, in any music library or sample library product. However, a “special use” license may be requested from Big Fish Audio, free of charge, if you wish to use this product as part of a musical work intended for use with music libraries (some conditions apply, and Big Fish Audio retains the right to refuse any request that does not meet those conditions). Any unlicensed usage will be prosecuted to the maximum extent possible under the law."